There was a lot of discussion of the US border during Wednesday night's final presidential debate. While Republican nominee Donald Trump reiterated his plans to build a wall between the border of the US and Mexico, stating, "We have no country if we have no border," Hillary Clinton pressed back with her own plans for immigration reform. History, politics, and demographics have helped to shape the international borders that separate countries around the world. Here, we've collected 24 photos of what borders between various countries across the world actually look like — from walls, to rivers, to barbed wire fences, to simple road markings. This NASA satellite image depicts the border between Haiti, which is much more arid, on the left, and the Dominican Republic, which is greener, on the right. This photo of the border between Israel and Egypt was taken by the International Space Station. The border is said to be one of the few that is so visible from space. 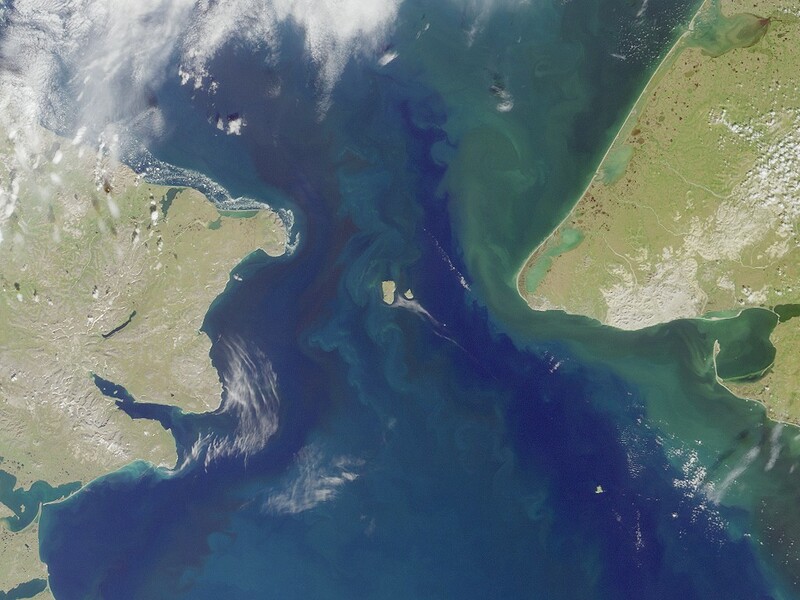 The Bering Strait separates the Seward Peninsula of Alaska to the east and Chukotskiy Poluostrov of Siberia to the west. The boundary between the US and Russia lies between the Big and Little Diomede Islands, visible in the middle of the photo here. The incredible Iguazu Falls mark the border between the Brazilian state of Paraná and the Argentine province of Misiones. Here we have the border fence between the US and Mexico. On the right lies Tijuana in Baja California, and on the left is San Diego, California. The border fence between the US and Mexico stretches into the countryside near Nogales, Arizona. According to The Atlantic, the fences and roads that mark the border end at certain points before starting again a few miles away. The US and Canada have one of the longest international borders in the world, spanning around 5,500 miles. This image shows Niagara Falls separating the two countries, with parts of Canada pictured on the left and the US pictured on the upper right. In the reading room of the Haskell Library, which was deliberately built along the US-Canada border, the international boundary is marked on the floor. Here, Canada is on the right and the US is on the left. The border crossing between Costa Rica and Panama is a single-lane bridge that stands over the Sixaola River. The bridge is regularly used by cars, trucks, and pedestrians. This image, taken by the International Space Station around 11:55 p.m., shows the nighttime appearance of the France-Italy border. The three highly lit areas are Torino in Italy, and Lyon and Marseille in France. The border can be seen in the center of the photograph. In Baarle-Nassau, a municipality and town in the southern Netherlands, you can clearly see the border between the Netherlands and Belgium. For clarification, the border has been made visible on streets with iron pins, indicating clearly whether each side is in Belgium or in the Netherlands. The border between Germany and the Netherlands is marked on the floor of the Eurode Business Center by a metal strip. There is a German mailbox and policeman on one side of the building, and a Dutch mailbox and policeman on the other. But a letter sent from the German side of the building takes a week to get to the Dutch side. Here, the subtle change in the road pavement indicates the border between the Republic of Ireland, which is to the left, and Northern Ireland, on the right, in the border town of Pettigo, Northern Ireland. Also taken by the International Space Station, this photograph shows the border between India (which is above the border) and Pakistan (which is south of the border). The border is the bright orange line visible in the photograph, and its illumination comes from the spotlights India placed along it to detect smugglers. The Wagah border ceremony has been a daily military practice that the security forces of India and Pakistan have followed since 1959, even though there have been debates about continuing it. Every night before sunset, the flags are taken down at the Wagah border in a ceremony that includes a parade by the soldiers from both sides. This International Space Station photograph displays the Iraqi fortifications that remain from the Iran-Iraq War. The diagonal line in the upper right shows the border between Iran (on the top) and Iraq (on the bottom). Torkham, pictured here, is one of the major border crossings between Afghanistan and Pakistan on the Durand Line border. In 2013, Bulgaria began plans to build a fenced Bulgarian-Turkish border, its purpose to keep refugees from the Middle East and North Africa from entering the country. The fence is 15 feet tall and 5 feet wide, with barbed wire. Here is another image of a soldier stationed outside of the Torkham Gate. A building indicating Afghanistan can be seen in the background. The Svinesund Bridge is an arch bridge separating the Swedish municipality of Strömstad from the Norwegian municipality of Halden. On the bridge is a line indicating Sweden, to the left, and Norway, to the right. The Anglo-Scottish border, the border between England and Scotland, runs for about 96 miles between Marshall Meadows Bay on the east coast and the Solway Firth in the west. The fence shown here is one of the markers of the border. The "Sino–Korean Friendship Bridge," which crosses the Yalu River, connects China and North Korea. The Guadiana River acts as a border between Portugal and Spain for 62 miles. Here, you can see an old unused police station in the town of Vila Real de San Antonio, in southern Portugal. Talia Avakian contributed reporting on a previous version of this article.